Free. Gratis. Kostenlos. Light for Sight’s partners will screen children with Down Syndrome for keratoconus for free – not just on today, World Down Syndrome Day, but every day of the year. It’s certainly not cost free for the medical practices, but we at Light for Sight insist upon this as a condition of membership. So why we insist, and why do they do it? The big picture is: to make sure these children don’t go blind. But actually, it all revolves around a molecule called collagen that makes up most of the front of the eye – the cornea. Imagine the eye is a party balloon: it’s pressurised (not with air, but fluid), but the strength and elasticity of the balloon keeps its contents inside. But if you have a weak spot in that balloon (which you can achieve just by rubbing it), you can produce a bulge – you can see that the rubber is weaker, and that part is far easier to pop. It’s the same with the eye. It’s pressurised with fluid (not air), its contents are contained not with rubber, but collagen, rubbing the eye can damage the collagen, weakening it, meaning that the eye can bulge (the “cone” in the cornea in keratoconus), ruining vision. If the bulge continues to grow, yes, ultimately the eye can rupture too. Keratoconus affects the young disproportionately. Keratoconus is more likely to develop in children than in adults, and if the disease develops in a child, it’s far more likely to be a fast-progressing, aggressive form.If a child is found to have keratoconus, they need to be treated with a procedure that strengthens the collagen, and therefore the cornea, as soon as possible. One way of slowing the progression of keratoconus is to avoid rubbing your eyes – but children forget (after all, rubbing your eyes does feel good). If you’re a child with a genetic disorder that affects collagen in tissues – you’re at an even greater risk of developing keratoconus. And unfortunately, Down Syndrome is one such disease: as many as 1 in 6 children with Down Syndrome will go on to develop keratoconus. 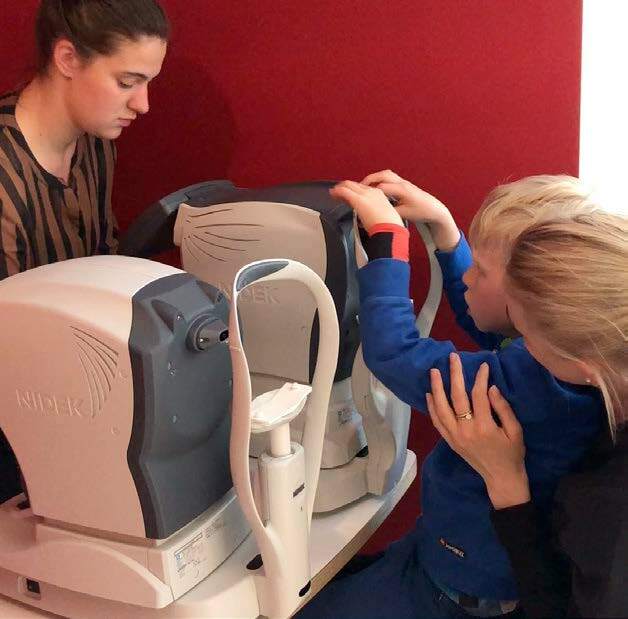 If you can get a child screened for keratoconus, you should. If the child has Down Syndrome, it’s even more important. We recognise this, and that’s why we want to make it as easy as possible to get these children screened. That’s why our partners have removed cost from the equation. If these children need treatment, the sooner they receive it, the better their vision will be. Everyone involved with Light for Sight wants to do everything they possibly can to help, so the questions we have for you are: What more can we do? How can we raise awareness? Would something like a screening day at a school for children with special education needs help? So please: help us to help you. Let us know how, by emailing info@lightforsight.org.